I may be really tiny but seriously my appetite is not. I love eating and I love food adventures! I love to try foods from different countries... They also say one of the good ways to discover a culture is to eat their food. That's why I love trying Korean food, Arabian food , Vietnamese food...etc! 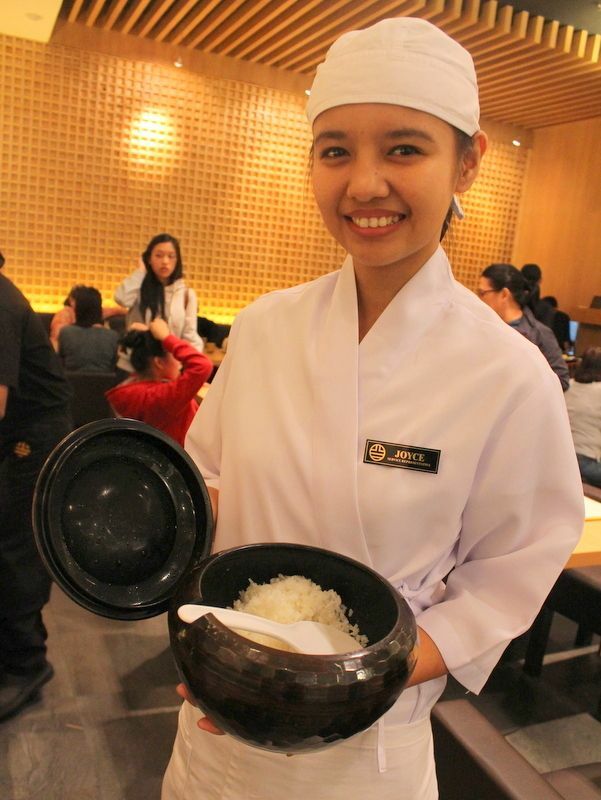 So, I was really happy when Yabu, a Japanese Katsu Restaurant, invited me for lunch at their restaurant. 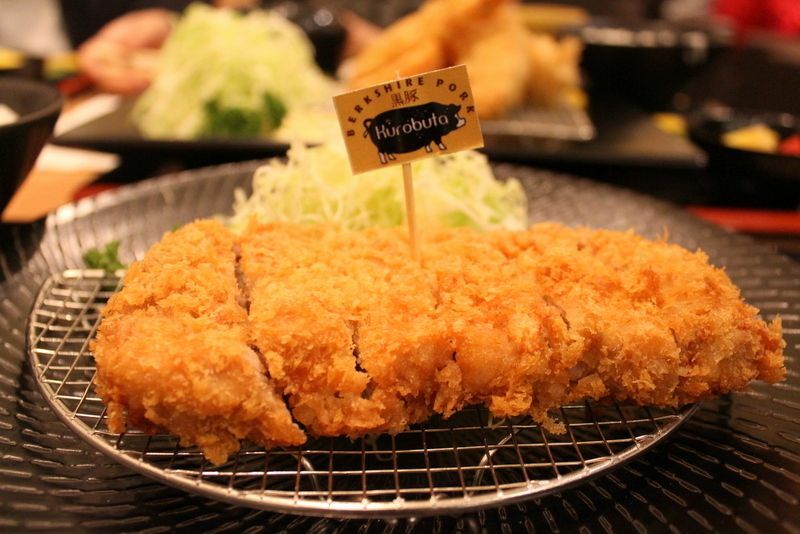 YABU : The House of Katsu! 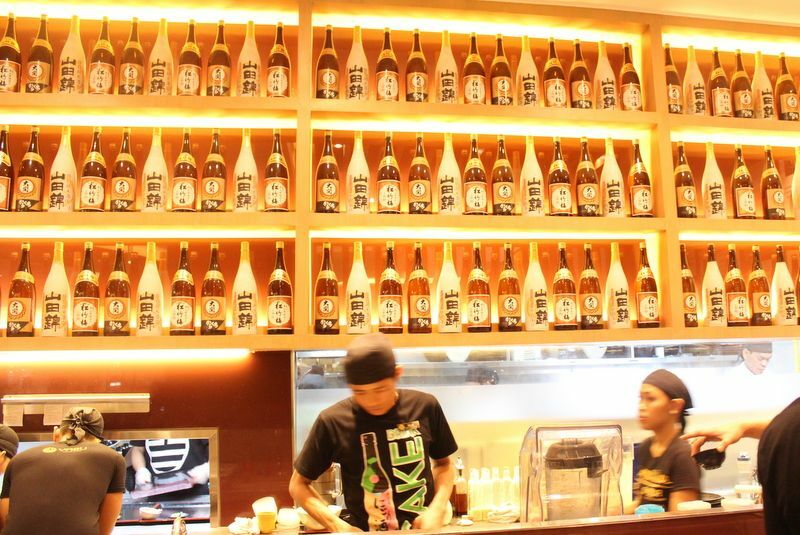 Yabu is a Japanese restaurant and it is also the first and only authentic Katsu restaurant here in the Philippines! 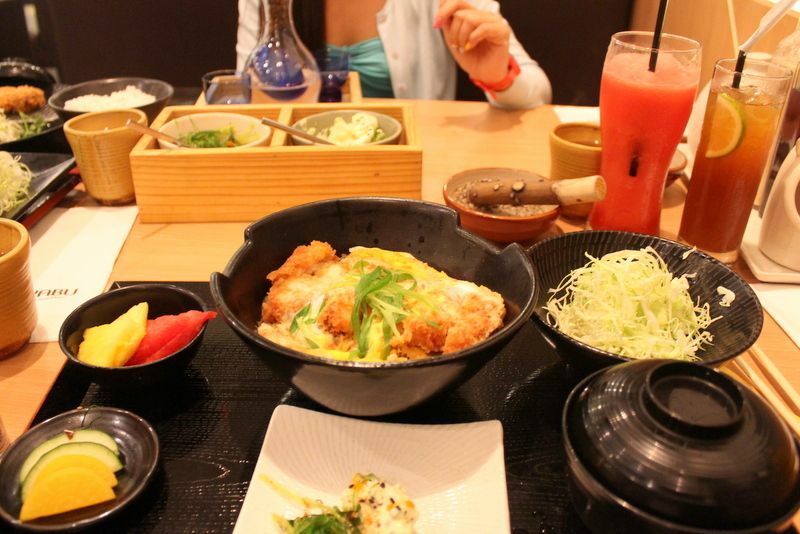 Yabu prepares its signature Tonkatsu dish so differently from any other local restaurants katsu dish that you immediately notice the difference upon first sight and first bite! 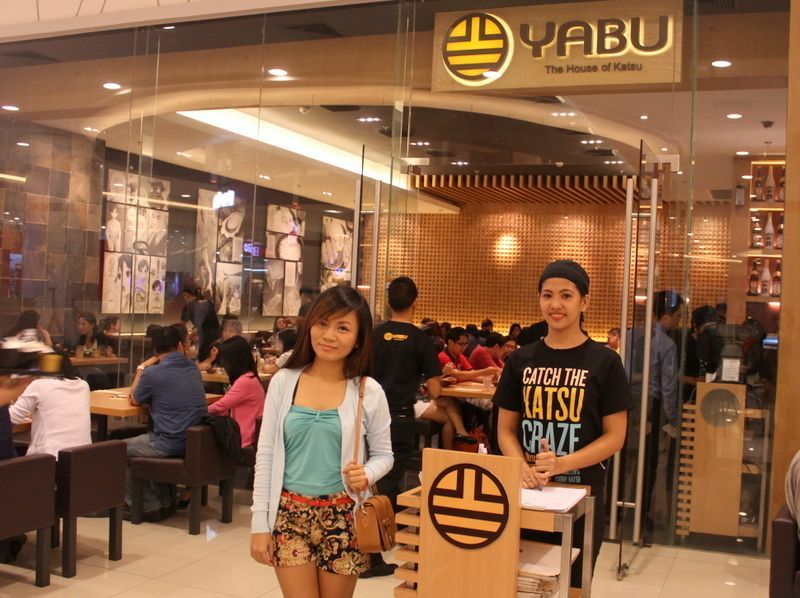 Since I live in Cubao, it was such a breeze to go to Yabu in Robinson's Magnolia. 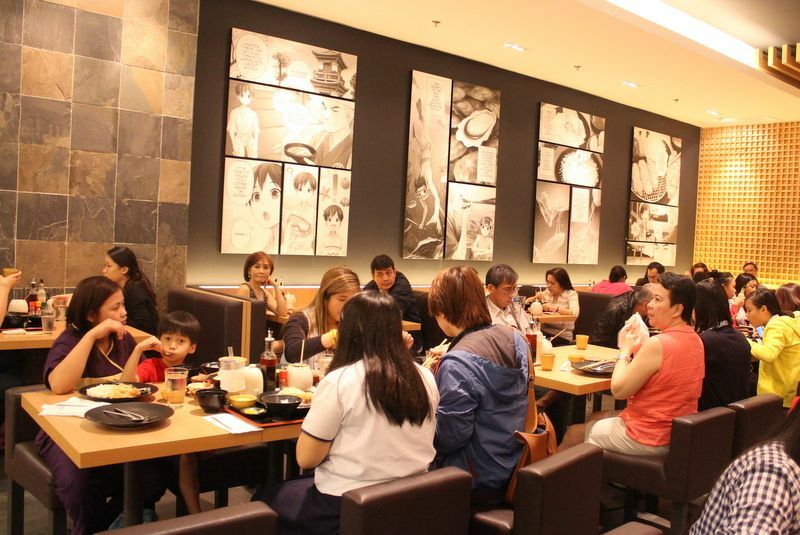 The mall opened in August and Yabu's branch there also just launched around the same time. 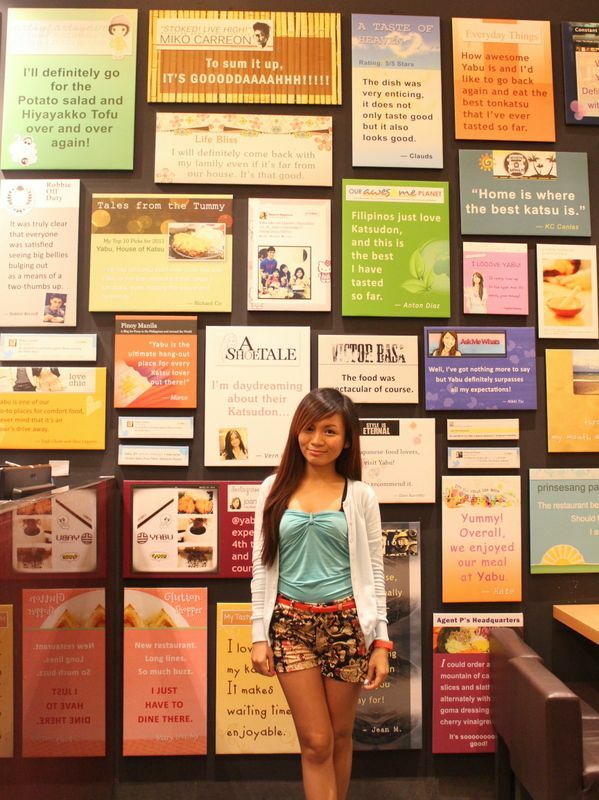 They will also open another branch soon at the SM Mall of Asia! We got there at around 1:30 in the afternoon and left the place past 4! lol. Yes, we ate for that loooong time. 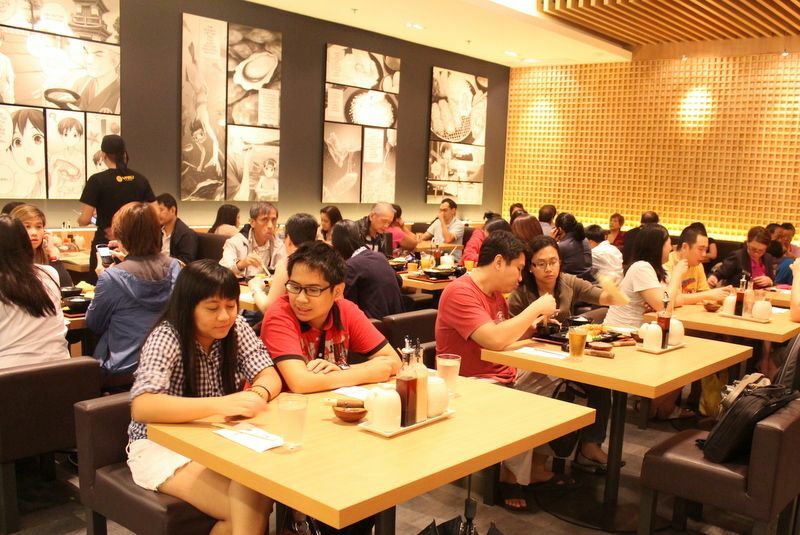 What's good at Yabu is although they have a lot of customers, they don't make you feel that you need to leave right after eating, unlike some fast food chains and restaurants. Everyone is so warm and the crew are so polite so you could enjoy your sumptuous meal. 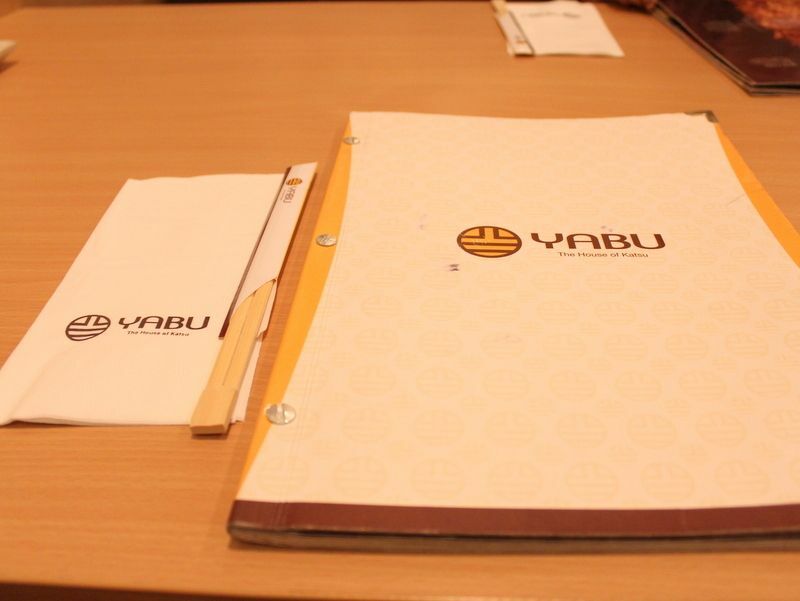 Yabu is a really cozy place to dine! It is modernly decorated and the ambiance of the place will make you feel at home. And where do you have those delicious meals? Of course, at home! I also like the yellow light of the restaurant, there's really something about it that makes a place look cozy and relaxing. 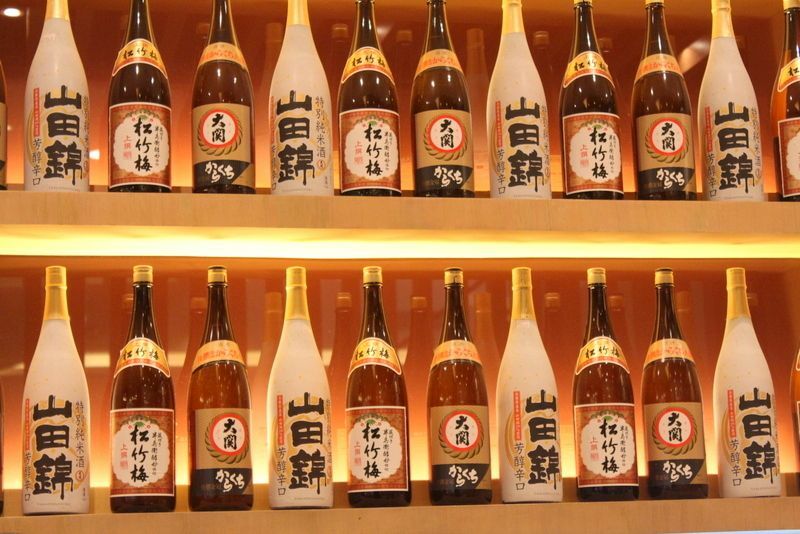 Sake bottles arranged as counter decoration. Anime lovers!  You will love this! Can you see the 4 big posters hanging on the wall? I love potato salad! think I can even call myself a potato salad master (lol, you know I'm kidding, right?) I really liked their Potato salad because the slices are not so big and not so tiny so each slice fits perfectly in the mouth. The seaweed salad was just heaven! Crispy, sweet and not too oily! Just perfect to start off a great meal! 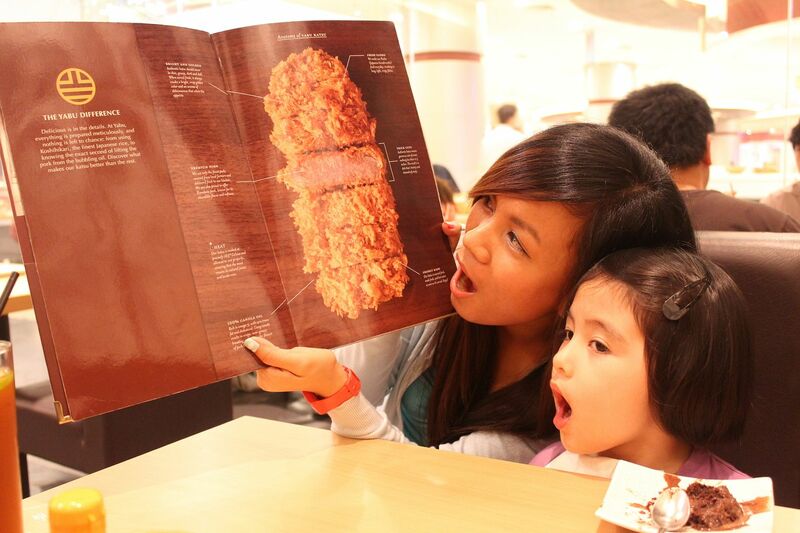 I asked our attendant for Yabu's best seller, he told me I should try their Premium Tonkatsu Set. 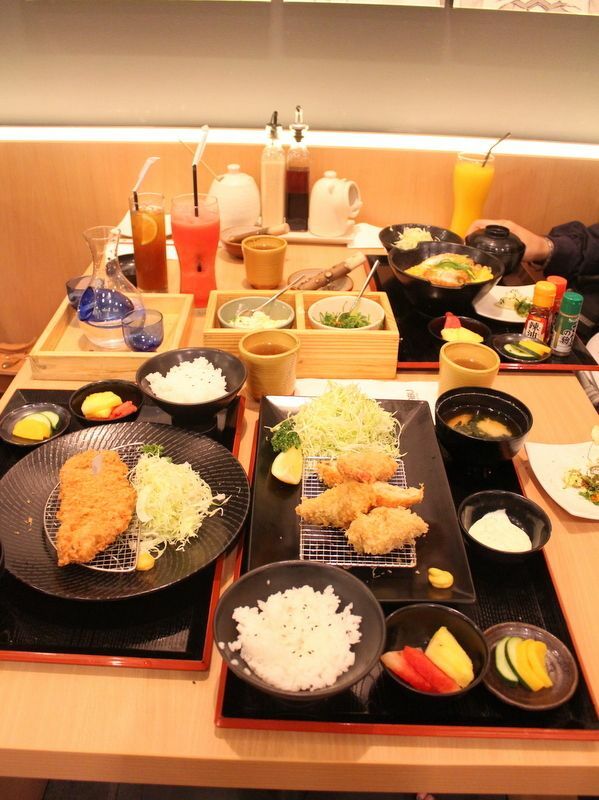 is served with unlimited Japanese rice, miso soup, Japanese pickles, unlimited cabbage with sesame dressing and a bowl of fruit! 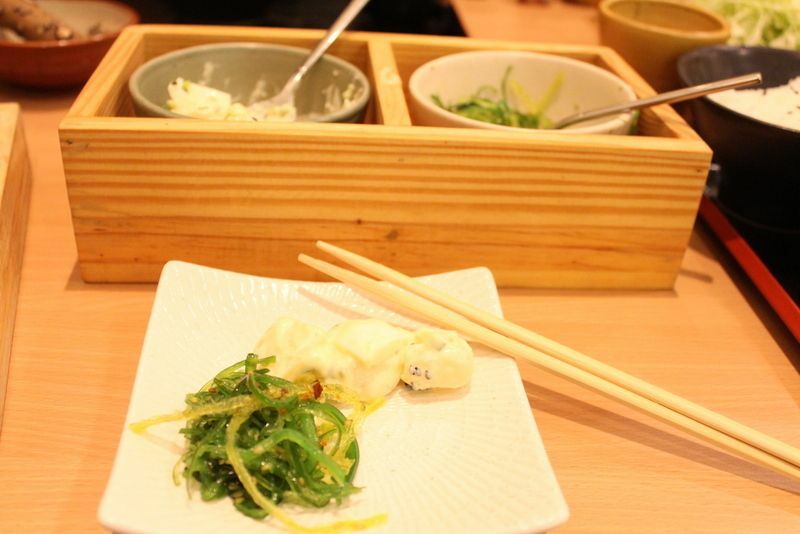 Ahh, just looking at the photo while blogging makes me so hungry again! 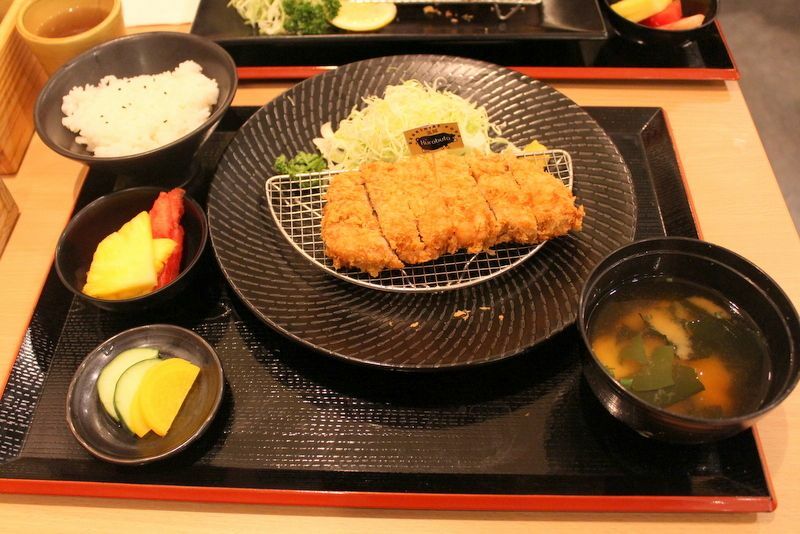 This pork katsu is really fine! You see the goodness from outside and taste the goodness once you bite! The meat is so tender and juicy, and it is not greasy and I like how it is crunchy and juicy at the same time. Of course, I tried mom's food, too! harhar! The katsus were all crunchy outside and juicy inside! 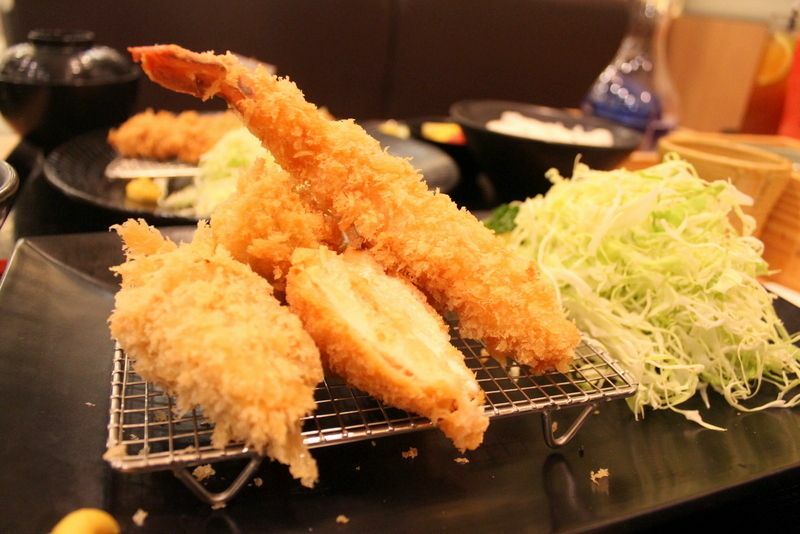 The servings are big to satisfy your seafood katsu craving! 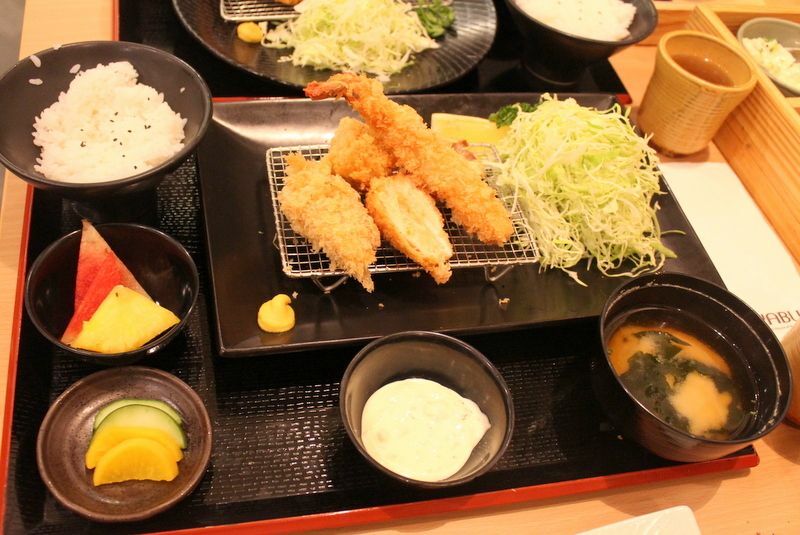 I liked the Salmon Katsu the most, so soft and tender! Yum! 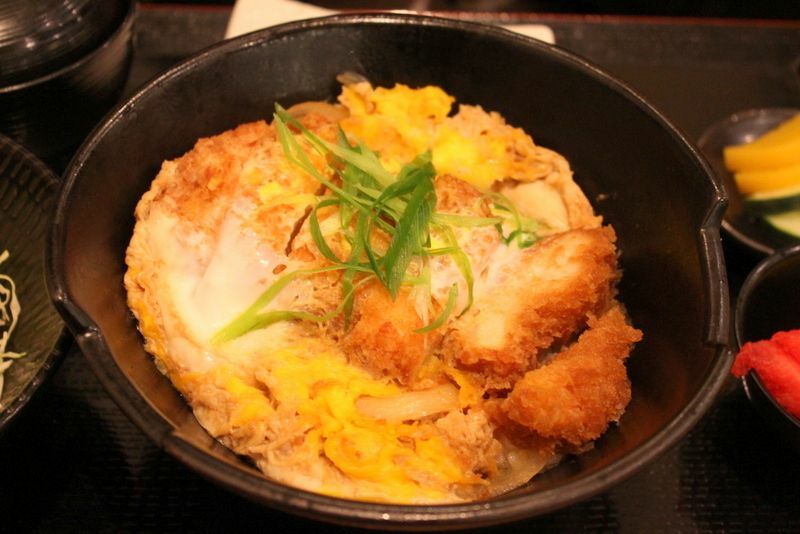 Yabu's original katsudon is delicious cutlets dipped in egg and dredged in fresh panko, served over a bowl of steamed Japanese rice and all covered in mouth-watering sauce and eggs! Ahhhh, just the description makes you hungry now, yes? A picture of us before eating our delicious lunch! Can you see how full our table was? All the yummy goodness and beautiful presentation on our table about to be enjoyed by our happy stomach. 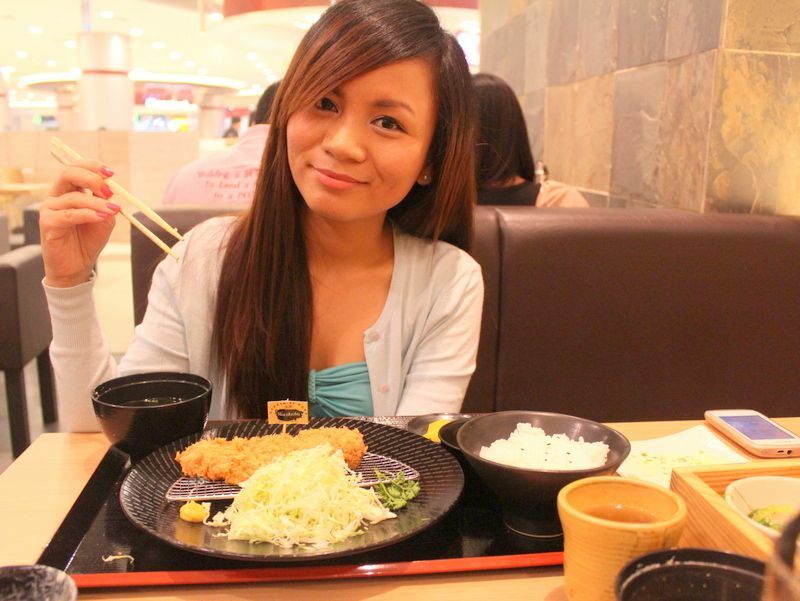 My friend, Nica, is a flight attendant. She didn't have anyone to leave her pretty daughter that day, so she left her with us. 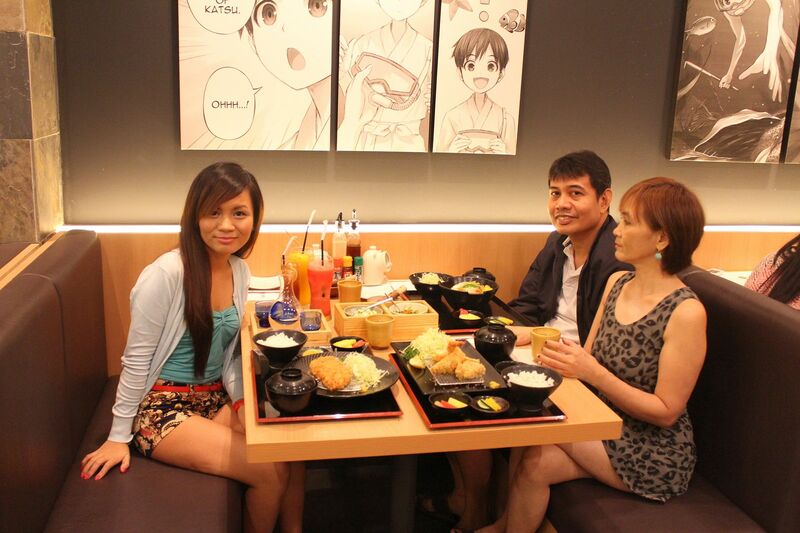 While eating, his dad dropped her off at Robinson's. The manager saw her and gave her ice cream! Yummy! 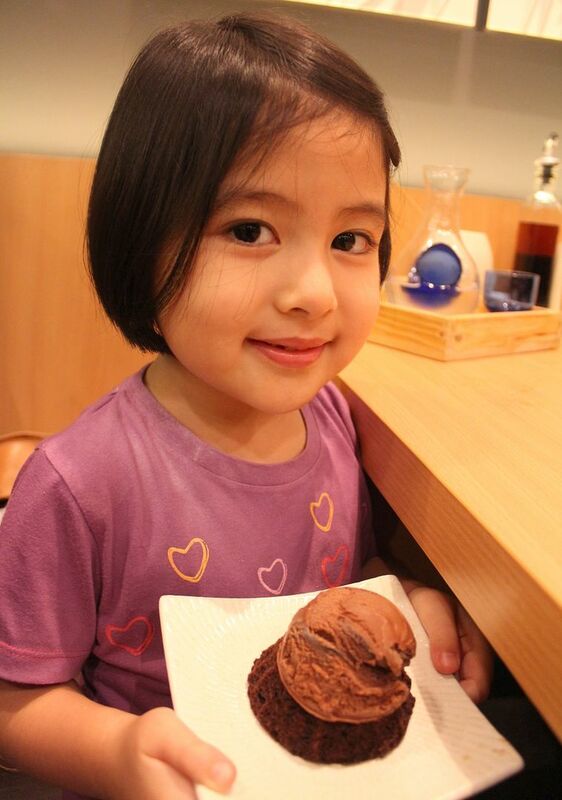 Pretty baby Jasmine, enjoying her chocolate ice cream! Of course, I also tried it! lol! Even their dessert is so good! 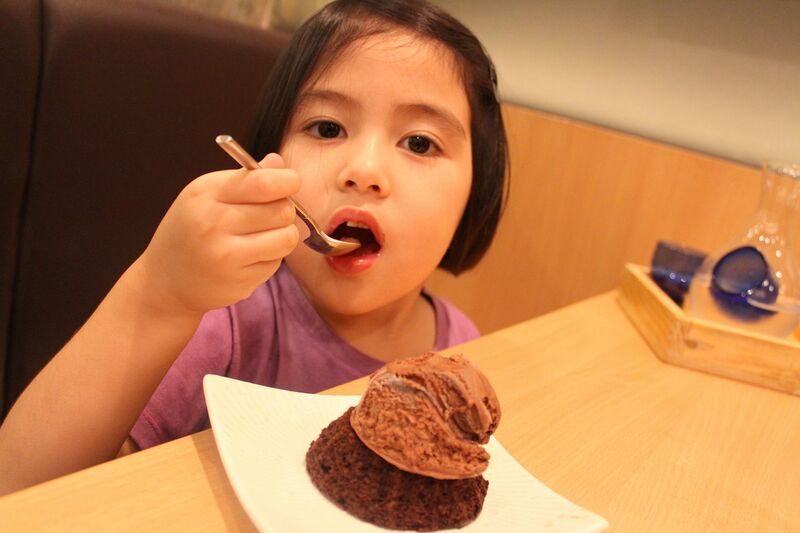 The ice cream is a creamy chocolate that sits on top of a chocolate brownie! So good! 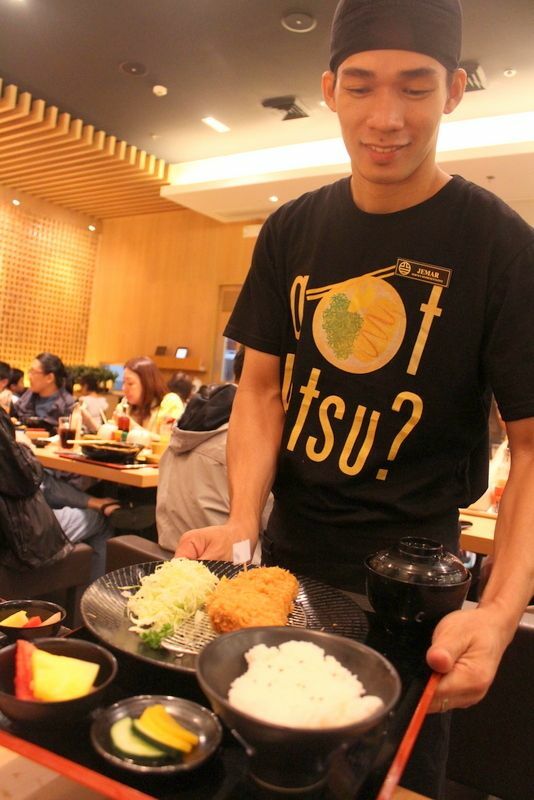 Yabu's staff and crew were all so kind and very very polite! That is REALLY one thing I always consider when I go to a salon, boutique or restaurant. Because really, it's not just buying the clothes or eating the food, it's also how the people served you with joy that makes the experience extra fun and memorable! 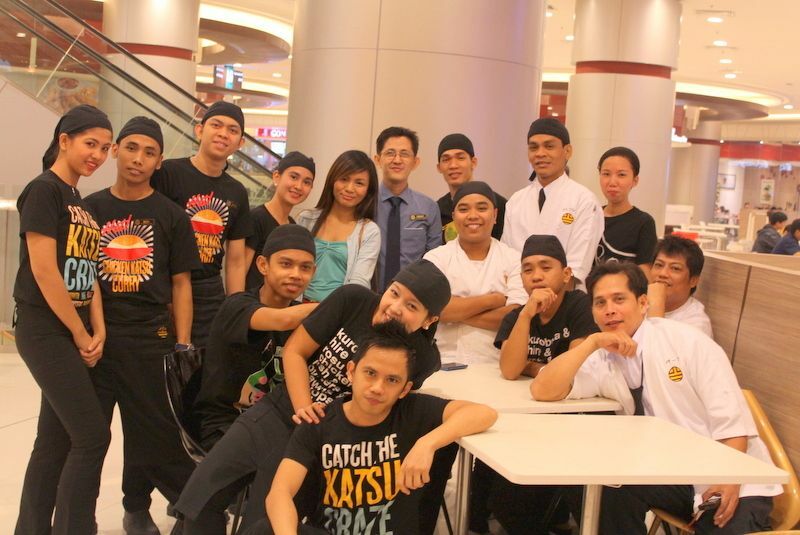 No, this is not even half of all their employees. 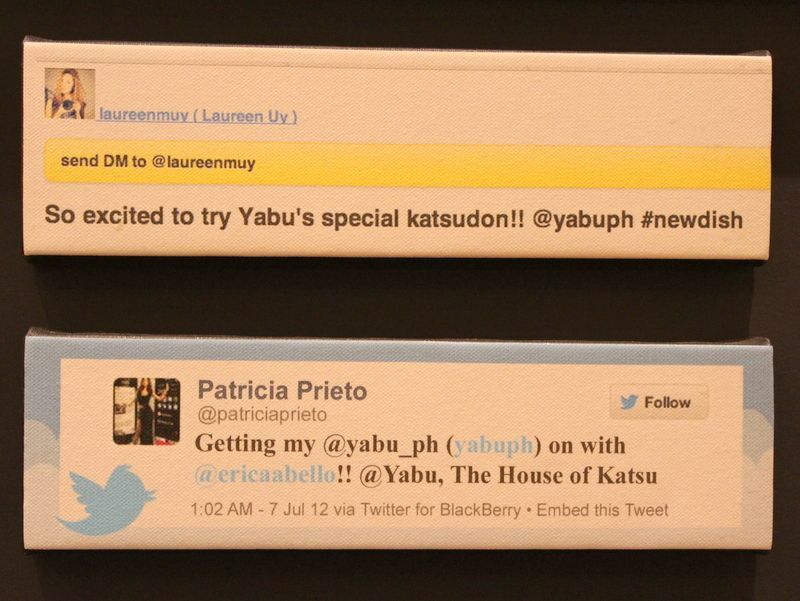 My mom even pointed out that Yabu has so many workers. I say it's good! 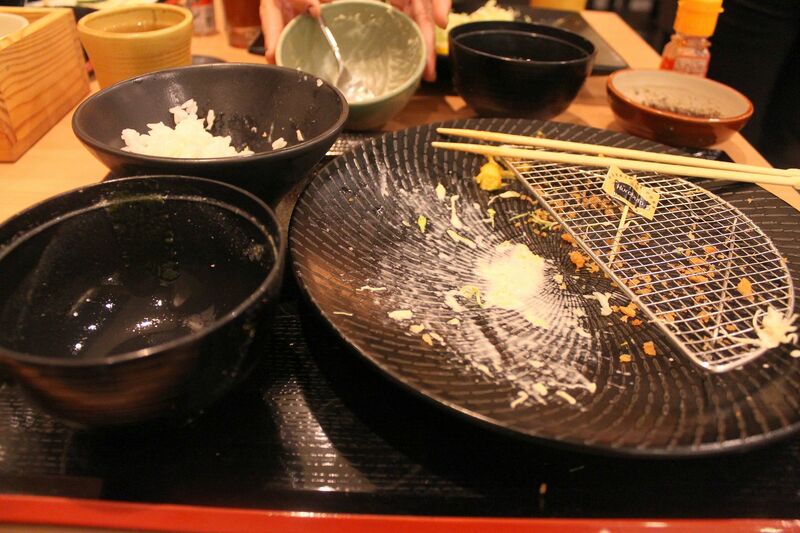 Our food was served in just a SHORT TIME! We didn't even wait for 10 minutes. We ordered, I snapped some photos and next thing, our food was served on our table! 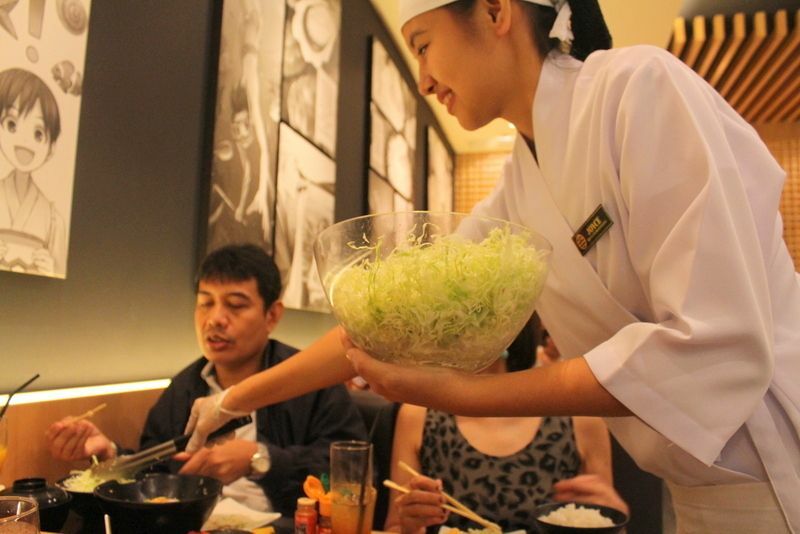 Thumbs up for polite, friendly and fast service, Yabu! 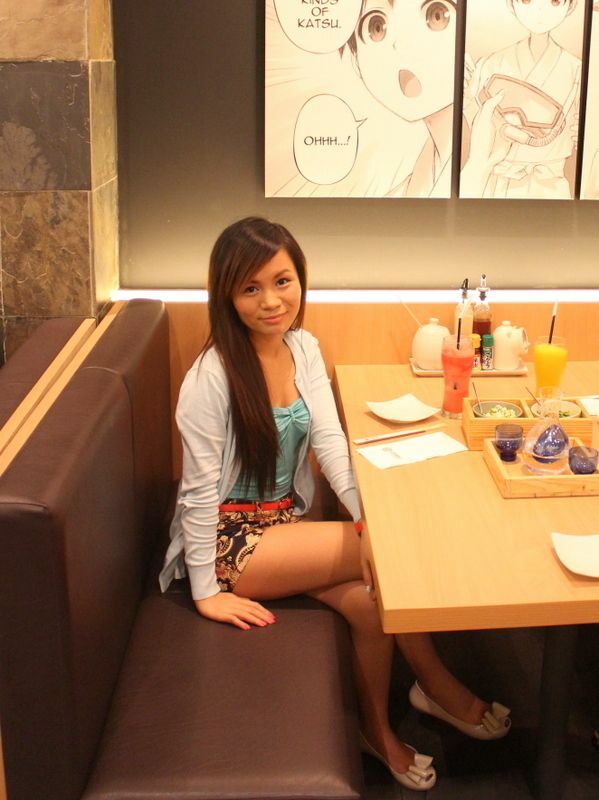 I really enjoyed dining at Yabu! The food was great and the service size was big! 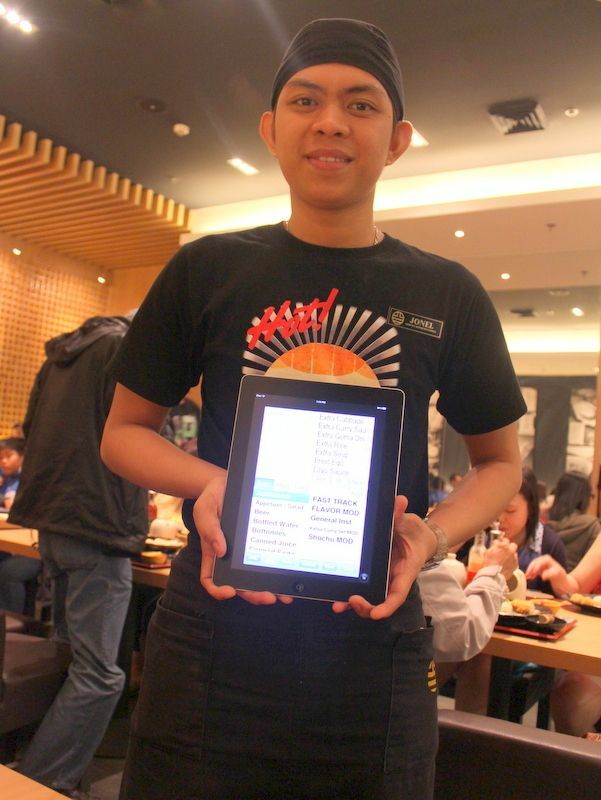 The service was impressive as the food was served quickly, perfect for people who are starving. The staff were all polite and friendly. And You get the value for you money. 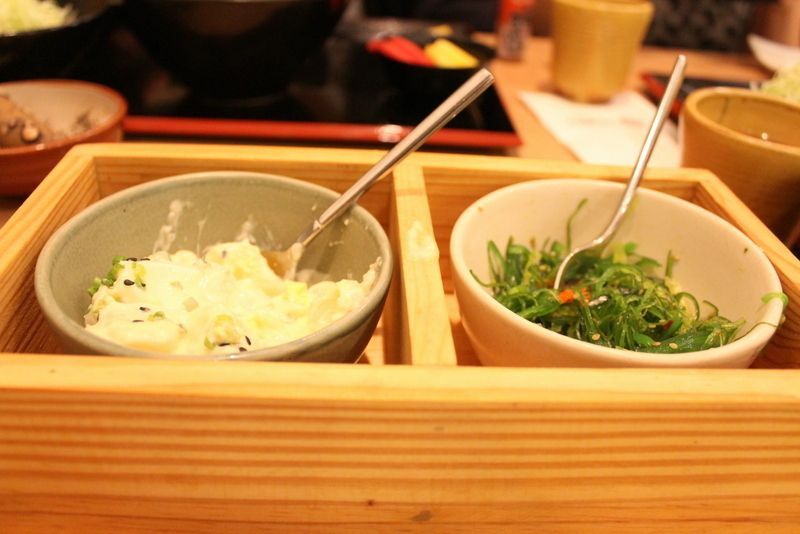 It was a delightful lunch at Yabu! I enjoyed everything from the Katsu, to the cabbage and to the crew! 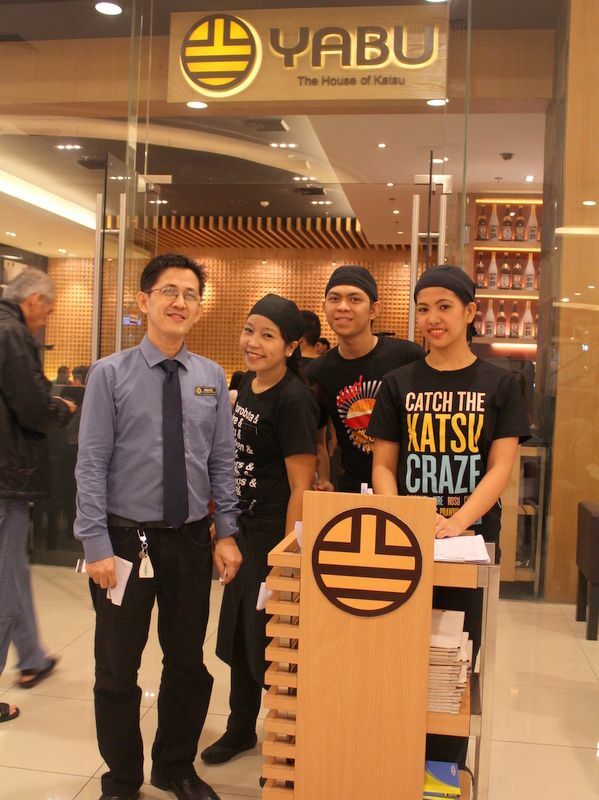 Definitely reccomending this to my friends and I will surely come back for more appetizing katsu!